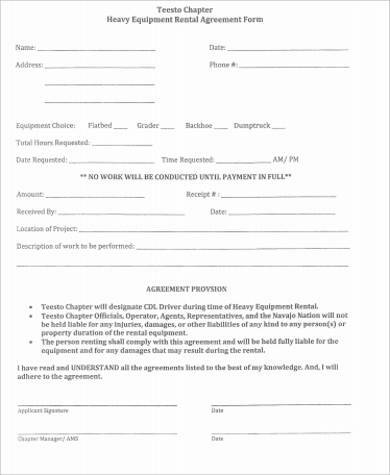 Equipment rental is a kind of service that lends any type of equipment of all sizes such as machinery to handheld tools, for a limited period of time.These Equipment Rental Sample Agreements is going to be a useful tool in getting insights about equipment rentals, and it might come in handy if you re going to create one, as this comes with free downloadable and editable files. The transaction is flexible and short-term. It could be on an hourly or daily basis and not longer than that. Schools usually lend tools to every subject that uses the laboratory. This includes chemistry lab, physics lab, cooking lab, and computer lab. They lend their computers to those customers who wish to use them, and the time range of usage is usually on an hourly basis. The rental transaction is contractual, the timeline is prolonged within months to years. Construction companies usually apply to this as its projects involve long-term usage of the tools rented. Construction companies that do not have their own construction equipment usually rents the tool for a long period of time. 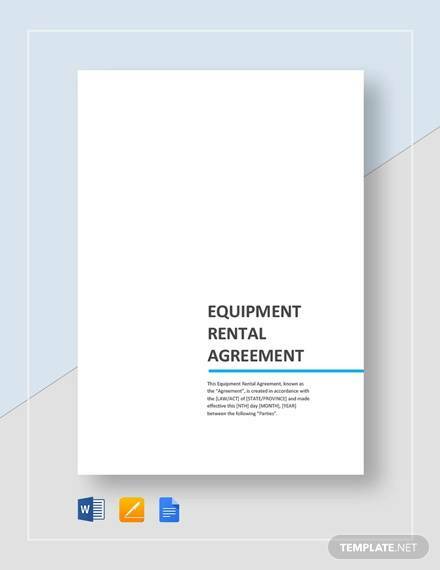 There are other companies who contract other companies that provide equipment rental. 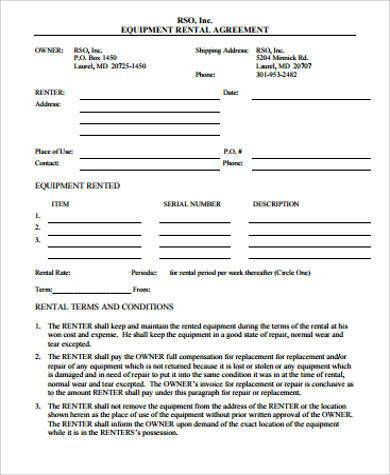 They usually rent office equipment such as computers, printers, or even chairs and tables. With this, they find it cheaper and sufficient than buying a new one, probably something to do with the maintenance expenses, as rental equipment companies usually provide the maintenance service. 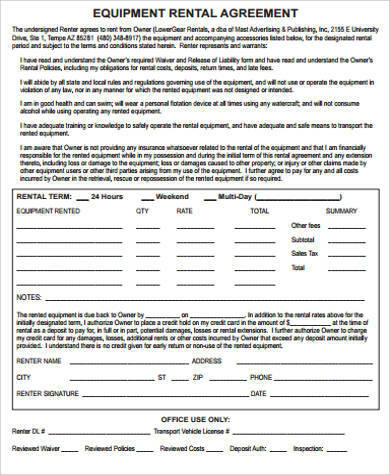 Rental Agreement Form is a kind of legal document that binds two parties. 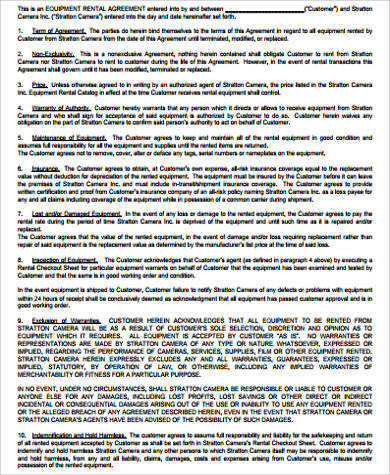 It states the expectations such as the terms and conditions within the transaction. 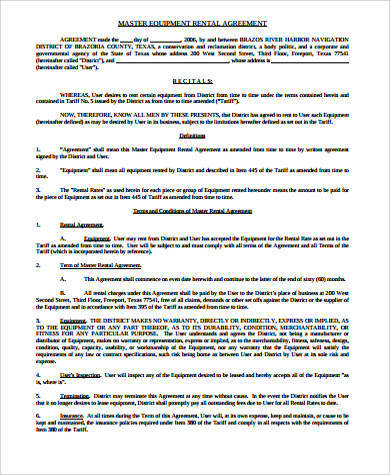 This will also serve as a record of agreement within two parties, and the written statement is ought to be respected and complied, as failure to do so will be a breach of contract and will lead to legal disputes. 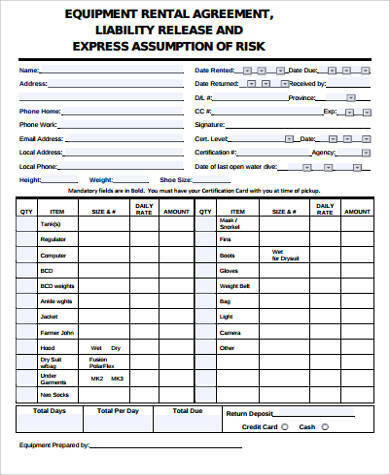 And as for the equipment rental, the risk of it is high, as there are chances of loss; however, the process is quite likely to be different than the usual rental agreement, since some dealers ask extra fee from the borrowers, just in case they fail to return the equipment, but on the other hand, prolonged usage of the equipment will also lead to extra charges as it exceeded within the agreed time limit; however, such charges are also mentioned within the written agreement. 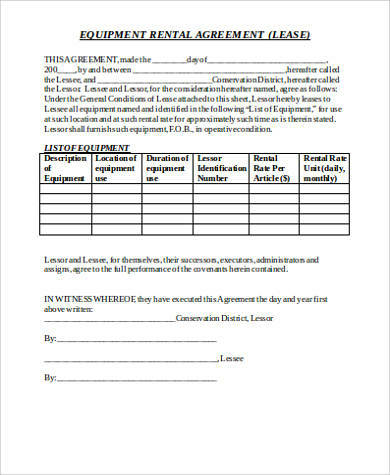 If you are looking for a generic type of lease agreement, you can also check out Generic Lease Agreements samples. 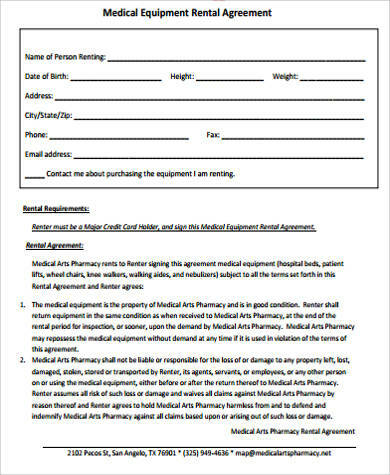 This includes free downloadable and editable files.